The office accepts major credit cards (Visa & Mastercard) as well as checks and cash. Coming from the south: If you are traveling I-81 NORTH, take Exit #310 and follow signs for Route 11 NORTH. 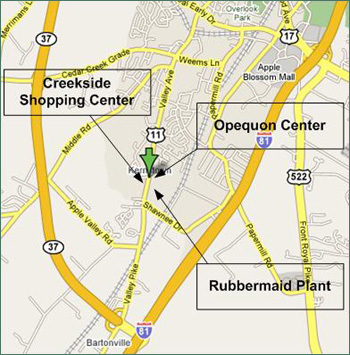 Take Route 11 North approximately 2 miles north to the OPEQUON CENTER (second right after the Rubbermaid Plant). Note Creekside shopping center is on the opposite side of Route 11 from the Opequon Center. Turn right into the Openquon Center and take your first left. Pull straight ahead and you will see #102. Coming from the north: Take 37 South, off of I-81 south. Follow 37 South, past the exit for Winchester Medical Center, until the Route 11 Exit (just prior to getting on I-81). Turn left off of this exit which puts you on Route 11 NORTH. Follow this approximately 2 miles north to the OPEQUON CENTER (second right after the Rubbermaid Plant). Note Creekside shopping center is on the opposite side of Route 11 from the Opequon Center. Turn right into the Openquon Center and take your first left. Pull straight ahead and you will see #102.